I wrote about counting mites recently. Even if I don’t, others do, and sometimes it gives information that may help you make a decision. John Harbo mentioned when he lectured in Sweden in May 2013 that before choosing the method for selecting for varroa resistance at the lab in Baton Rouge in the 1990th, their statistician helped them evaluate different methods. Their conclusion was that selecting for infertility of mites, then called SMR, later VSH, was the best method. Using one-drone insemination on 43 queens from a source of collected survivors they started the work in 1995 and in 1998 the goal was achieved. Impressing to say the least. Why havn’t this result have had more impact during the years. The queens produced at that early stage in the process were so inbred they were superceded quickly and the honeyproduction was low. They got bad reputation and beekeepers didn’t understand how to use the resistant queens fully. The situation today is very different. One selection method among those not choosen, was checking the mite population. Though this method is still promoted buy others and used as well. Maybe because some have found it valuable in this matter. And most of us are living in free countries and can do our own choice. 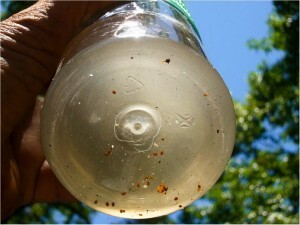 Another reason for doing mite counts is for making a desicion if or when mite tretament is needed. 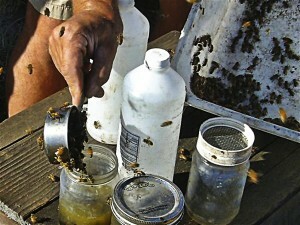 In US it’s been said the threshold for treating is 3 mites per 100 bees in an alcohol wash. Some say this number seems to have to be lowered as viruses are worse nowadays. That probably is valid for all those moving their bees to almond pollination, where the bees share the latest in pathogens, pests and pesticides. Maybe all this treatment used during the years has forced the mites to answer with reproducing quicker in that they stay in the phoretic stage (on the bees and not in the brood) for a shorter period before they enter brood cells again. Anyway, my small scale beekeeper friend cooperating with me, Leif Stromberg, quite on his own with his bees but not totally; he has 15 colonies, use the threshold 5 mites per 100 bees for treating, in october only when there’s no brood. It’s a help for deciding if he shall trickle oxalic acid. He trickled 4 colonies in autumn 2013. His winter losses are small. He lives 100 km north of me and cooperates there with Bjorn Lagerman, 90 colonies, with basically the same stock of bees as me too. His story could be told in another post. 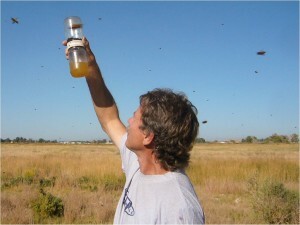 Pouring bees in the bee shaker (pictures used with the kind permission of Randy Oliver). This entry was posted in Breeding, Featured, Varroa, Varroa level and tagged alcohol wash, counting mites, John Harbo, Randy Oliver, virus by Erik. Bookmark the permalink. Thanks Erik, very nice contribution! I have enjoyed reading it.